A very early planning map of Prospect Park. Design for Prospect Park as Proposed to be Laid Out for The City of Brooklyn. A rare 1871 example of Vaux & Olmstead's map of Prospect Park, Brooklyn. Issued shortly after its 1867 completion, this is one of the first published maps to focus on the design of Prospect Park. Depicts the park as a whole and includes pathways, lakes, buildings, individual trees, rocks, and elevation measurements. The streets and avenues surrounding the park are also noted. This extraordinary map reveals Prospect Park as conceived by the landscape architects, and indeed 'Artists,' Vaux and Olmstead. 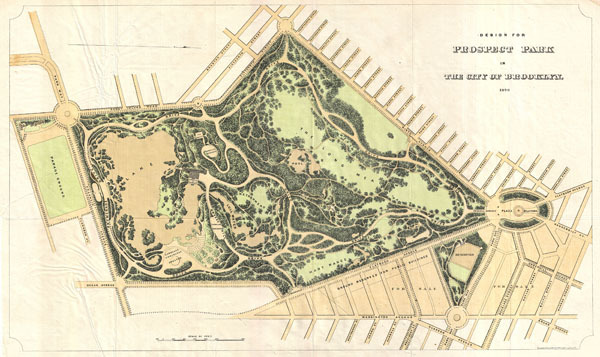 Vaux and Olmstead were awarded the task of designing Prospect Park in 1866 by the Brooklyn Common Council. Olmstead's vision drove the overall design while Vaux concentrated his attentions on bridges, buildings, and other structures within the park. The creation of Prospect Park, which was to consist of some 585 acres of public forest, pathways, promenades, lakes, bridges, and meadows, was a seminal moment in civic urban design. The park itself was designed as a whole with every tree, pond, and bench meticulously planned. Olmstead wrote: 'Every foot of the parks surface, every tree and bush, as well as every arch, roadway, and walk and been placed where it is for a purpose.' Though Olmstead is best known for his work in New York's Central Park, there are many who consider Prospect Park, his second masterpiece, to be his finest. Today, because of Vaux and Olmstead's efforts, Brooklynites have the privilege of enjoying what is, without question, one of the finest example of a planned urban public recreation area in the world. William Bishop (fl. c. 1855 - 1877) was the on-and-off city clerk of Brooklyn from about 1860 to the early 1870s. Bishop's primary opponent for the position was newspaperman Henry McCloskey. One of the duties of the city clerk was to publish an annual report detailing the government, progress, urban planning and development of the city. The resulting Manual of the Common Council of the City of Brooklyn was published each year of Bishop's tenure as city clerk. The first Brooklyn Manual was published in 1855 following the consolidation of the city. The Manual was published under various names and in various forms until 1888. Bishop, William, Manual of the Common Council of the City of Brooklyn, 1871, 1871. Very good condition. Original folds. Upper left quadrant exhibits some creasing to either side of original fold line. A repaired tear, from left center, extends 3 - 4 inches into the map. Blank on verso. Bulletin of the New York Public Library, Vol 6, 1901, Page 86 (references both this and the 1868 edition).